We’d love your help. Let us know what’s wrong with this preview of My Sweet Kitchen by Linda Lomelino. With an offset spatula laden with buttercream in one hand and a camera in the other, Linda Lomelino has made her mark as one of the most exciting recipe creators and food photographers in the world. My Sweet Kitc The world of desserts has never been more delicious, or more elegantly styled. With Linda Lomelino as your baking muse, your kitchen just got a whole lot sweeter. To ask other readers questions about My Sweet Kitchen, please sign up. I have been baking up a storm these last couple of weeks thanks to Linda Lomelino and her new recipe book, My Sweet Kitchen. I was first drawn to this one for its gorgeous cover and the fact that Lomelino shares some of her photography tips in the book. If you are anything like me, taking pictures for social media or the blog is a struggle. This book is a really useful guide to anyone wishing to learn baking basics and how to capture images of the process with ease in a genuinely kind and forgiving manner. My Sweet Kitchen is filled with beautiful photos that will make the reader both drool and become excited to get baking and styling. Lomelino walks through some of her photographs in the book and describes in detail the process to go from a good photo to an eye-popping masterpiece. Her method is so laid back and she gives her readers permission to make mistakes, which is comforting to me because I make lots of them! I am not about to say that my pictures are gorgeous, but I do feel as though I have made some improvements with her suggestions. These yummy blueberry bars have actually become one of my favourite new go-to desserts. They are so easy to make and are basically a tea biscuit with fruit. I have made them a couple of times now and I love that they satisfy my sweet tooth in a simple and quick recipe. First off, I am going to say that I have never used dulce de leche before and I am a new fan. I have always used basic caramel sauce as a topping for ice cream, but this incredible sauce made from condensed sweetened milk is so decadent. These cookies have a hint of cinnamon, white and dark chocolate as well. The recipe only makes a few cookies, but they are definitely worth the effort. I also used Lomelino’s tips for adding movement in a food picture. The recipe for these is over on her blog, if you would like to give these a try! These chocolate cupcakes are effortless to create and use ingredients that are typically on hand. While Lomelino provides a wonderful tutorial on how to pipe designs onto cupcakes in the book, this frosting goes on nicely just using a spatula. This recipe is included as an image to view on Amazon, if you are interested in creating these as well. My Sweet Kitchen is a beautiful book filled with 50 yummy recipes and tons of how-to tips and lots of great inspiration! I highly recommend this book to anyone who has a sweet tooth and loves to bake! Or loves to take photographs of your foods. Or to those who want to learn how to make sweets and bake better! Really, I would recommend it to everyone! I reviewed this book for NetGalley. This is the second cookbook by Linda Lomelino I have read. And just like the first, it is beautifully photographed with delicious and elegant recipes and great food writing. It is just adorable. Ms. Lomelino is Swedish and while a lot of her recipes are classic baking staples, some of them are good old US baked delights (chocolate chip cookies) though a Swedish prism. Very interesting. I look forward to baking some of her recipes. And as always, Ms. Lomelino does I reviewed this book for NetGalley. Recipes are a range of easy to fiddley, but nothing too overwhelming. I tend to save more involved recipes for holidays when I have more time. My dad is retired, has discovered baking, and LIVES for fiddley. This book is right up his ally and he's now going through Lomelino’s recipe blog. He’s ready for berries to be in season because he really wants to try her Barry Galettes recipe. Don’t get thrown off by recipe titles like “Bundt Cake with Elderflower Glaze” or “Portuguese Pasteis de Nada”, most of the recipes are easy to make with readily available ingredients. The Portuguese Pasteis de Nada, in my opinion, is the most difficult recipe in the book. But I might have an unnatural fear of working with puff pastry. What a delicious dream of a book! Sometimes baking cookbooks can seem daunting, and the recipes nearly impossible to conquer, but 'My Sweet Kitchen' has inspired me to get some ingredients and start baking! The photos and styling are also beautiful, and I especially enjoyed the chapter spent on teaching the basics of food styling and photography. Thoroughly enjoyable - I look forward to seeing the physical copy once it is published! Thank you to the publisher and to NetGalley for the ARC in exchange for an honest review. 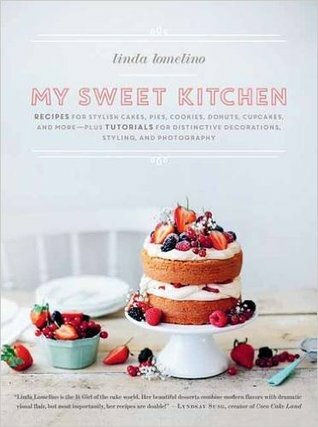 My Sweet Kitchen by Linda Lomelino is a must have book for all bakers. Full of great tips and tricks for getting your delicious treat to turn out perfectly. Linda explains the tools necessary for all things baking and the ingredients you need, and how to prep them. A perfect starting point for the most novice baker to become a pro, and recipes so beautiful and creative they will inspire even the most expert bakers. I received a copy of this book from NetGalley!